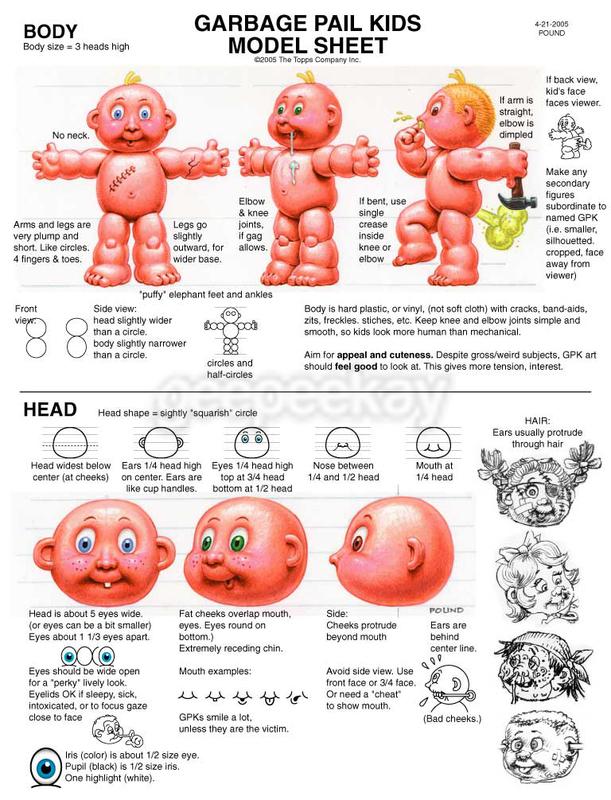 This page provides a high-level look at the ORIGIN AND HISTORY of Garbage Pail Kids. Think of it as a one-stop-shop to get yourself educated on all-things-GPK! In November 1984, Topps Chewing Gum, Inc. filed for the registration of the trademark "Garbage Pail Kids"
The response the stickers received in the public was epic. Stores could not keep them on the shelves. Schools were banning them from classrooms. Movies and morning cartoons were developed. In addition to nine different series being released in the first 24 months, the market also saw an influx of Garbage Pail Kids merchandise. From trash cans to Halloween costumes to keychains to sunglasses…Garbage Pail Kids were everywhere. In May, 1986 (following the release of Original Series 3) Topps was sued by Original Appalachian Artworks, Inc. (OAA) for copyright infringement, trademark infringement, and unfair competition. The plaintiff OAA manufactured and marketed soft-sculptured dolls created by Xavier Roberts called "Cabbage Patch Kids"
The changes to the style following the lawsuit were not received well, and sales began to decline. 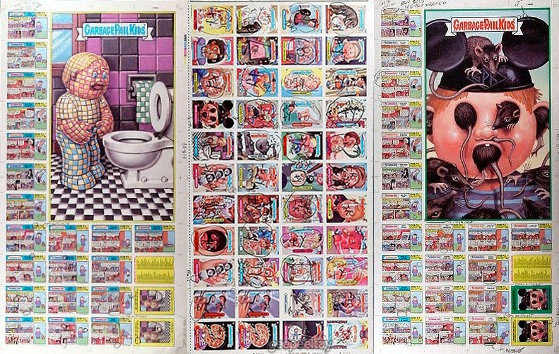 Kids were outgrowing the fad and Topps made the decision to put an end to the Garbage Pail Kids line of stickers. Original Series 15, released in December of 1988, was the last of the Original Series releases. Interestingly enough, Topps made the decision to quit the line during the middle of production on Original Series 16. Rough images for the stickers, card backs, box, and wrappers had all been developed, but in the end were never produced. In 1989 an uncut sheet of OS16 ‘a’ cards was found in a dumpster behind the Topps building, providing collectors with a glimpse of what almost was. And in 2002, the Topps Vault auctioned off some correction sheets and box proofs. The turn of the century brought with it a fascination with all-things-80s…and what is more 80s than the Garbage Pail Kids!? Topps decided to capitalize on this craving for nostalgia and released All New Series 1 in August, 2003. The experiment proved successful so Topps made the decision to move forward with the All New Series line. 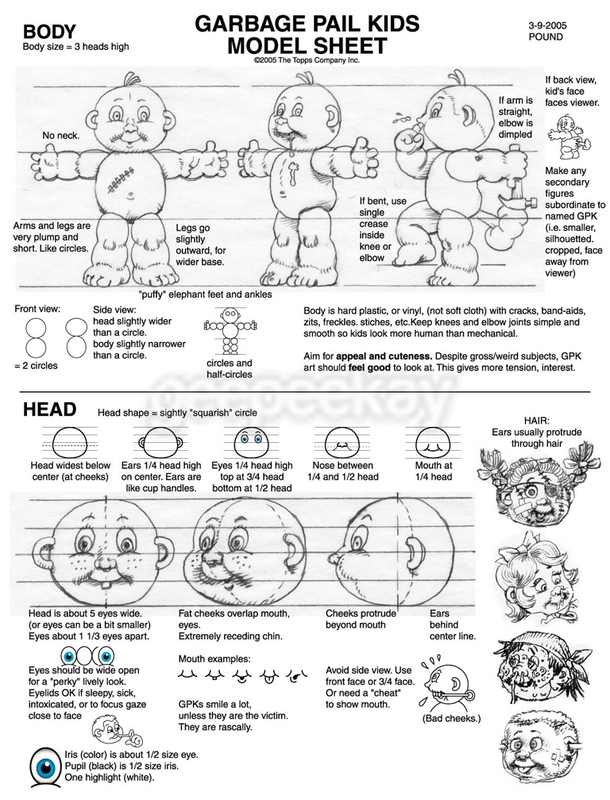 In 2005, John Pound created an all new Model Sheet that future artists could use to help keep the look consistent. The Garbage Pail Kids have continued to resonate with both children and adults alike, and to date have seen over 30 series releases (and still going strong!! ), as well as toys, clothing, comics, and even a rumored new movie. I have no idea how long the Garbage Pail Kids ride is going to last…all I do know is that I’m going to enjoy every second of it!